The University of Virginia, after vigorously resisting a Freedom of Information Act (FOI) request for data related to the emails of Michael Mann, was the subject of a court order to make them available. While global warming is known worldwide for its claim that manmade warming would doom the Earth, the names and machinations behind the fraud are far less well known. 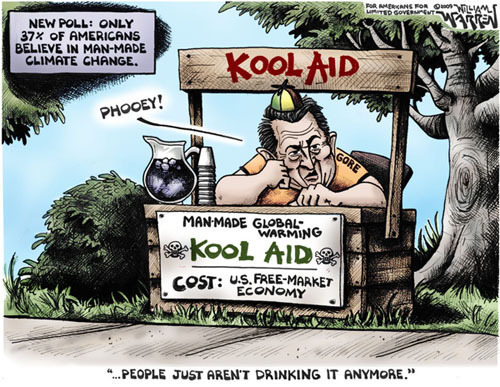 Mann, a climatologist, was part of a relatively small clique of charlatans who, working for the United Nations Intergovernmental Panel on Climate Change (IPCC), conjured up all manner of “proof” that the Earth was on dangerous trajectory, heating up. Mann invented the “hockey stick” graph that demonstrated this bit of climate magic. With Al Gore as the most famous face of global warming, Mann and others lent credibility to the IPCC that called for massive reductions in carbon dioxide (CO2) emissions resulting from energy use of fossil fuels, primarily oil and coal. Mann’s problem began when the “hockey stick” graph was debunked and demolished as bogus. All this occurred while Mann was on the faculty of the University of Virginia and while large amounts of research grant money were being received by the University to support Mann and others. via Global Warming Charlatans Feel the Heat. Romney is pandering to the center. He admits to ignorance and is just spouting what he thinks people want to hear. 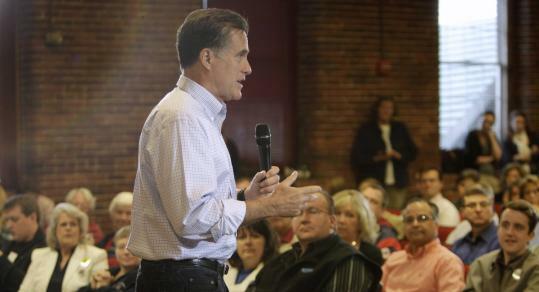 MANCHESTER, N.H. — In the first town hall of his freshly announced presidential campaign, Mitt Romney yesterday reaffirmed his view that global warming is occurring and that humans are contributing to it, a position that has been rejected in recent years by many Republicans as the issue has taken on a greater partisan tinge. After opening remarks in which Romney blamed President Obama’s policies for the new anemic hiring figures, the first questioner from the floor — a software developer from Hanover, N.H. — wanted to know the candidate’s position on climate change, an issue his opponents have generally avoided so far. Romney has made clear that he opposes cap-and-trade, a system that would combat climate change by limiting total emissions and forcing polluters to pay for the greenhouse gases they produce. Instead, he said yesterday, he wants to wean the country from its dependence on foreign oil by seeking alternative sources of energy, and he said Americans should do more to conserve. via Romney reaffirms stance that global warming is real – The Boston Globe. of them every year. The climate models all predict that as the planet warms, a hot spot of moist air will develop over the tropics about 10 kilometres up, as the layer of moist air expands upwards into the cool dry air above. During the warming of the late 1970s, ’80s and ’90s, the weather balloons found no hot spot. None at all. Not even a small one. This evidence proves that the climate models are fundamentally flawed, that they greatly overestimate the temperature increases due to carbon dioxide. system would be unstable. The climate system is no exception, and now we can prove it. thermometers surveyed by volunteers violate official siting requirements that they not be too close to an artificial heating source. Global temperature is also measured by satellites, which measure nearly the whole planet 24/7 without bias. The satellites say the hottest recent year was 1998, and that since 2001 the global temperature has levelled off. Why does official science track only the surface thermometer results and not mention the satellite results? control over all energy use. And to curb emissions on a world scale might even lead to world government — how exciting for the political class! David Evans consulted full-time for the Australian Greenhouse Office (now the Department of Climate Change) from 1999 to 2005, and part-time 2008 to 2010, modelling Australia’s carbon in plants, debris, mulch, soils, and forestry and agricultural products. He is a mathematician and engineer, with six university degrees, including a PhD from Stanford University in electrical engineering. The comments above were made to the Anti-Carbon-Tax Rally in Perth, Australia, on March 23.